In our last post we left you hanging (check it out here) with a hint that God had something in store for the village of Gorbendehun and it’s true, He did! 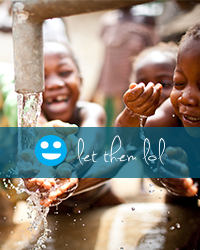 When we visited in 2014, our Let Them LOL US and Sierra Leonean team saw a devastating need for clean water in this community longing for change. In April 2015, another US team was able to visit, working alongside Sierra Leonean staff. On the to-do list was a visit to Gorbendehun. But from the outset, this visit would be different. The very first goal was to photograph…their (very) newly completed well! 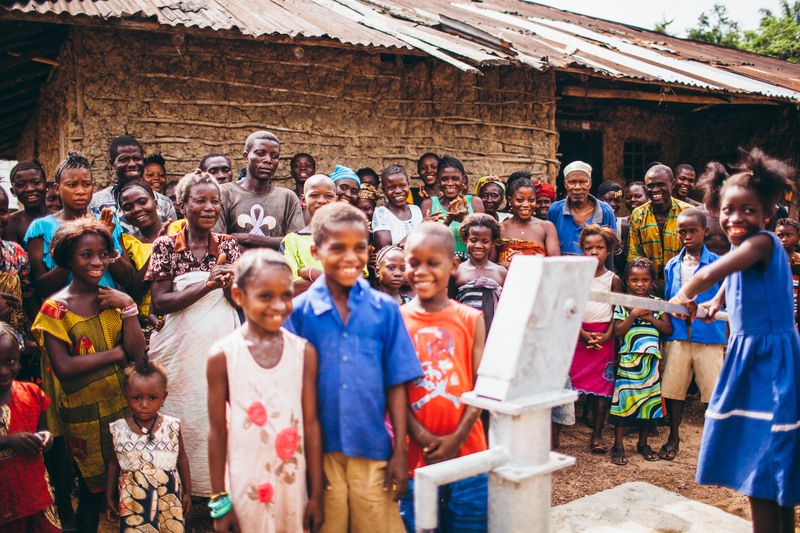 As we entered the village, community members surrounded the brand new well pump, encouraging three children to stand proudly for pictures as two school students pumped water and the rest of the people stood singing enthusiastically at the spectacle! The boundless joy was palpable as we took in the gratitude this community felt for the precious reality of all this well provides: health, hope, a future. In humility we stood in awe and respect. These moments are made possible because of the connection made by donors like you to communities like these who realize people across an ocean recognize and care about their lives! Again, this community and its leaders wanted to lead us down the tree-lined, winding path toward their original water source, but this time the reason and feeling were different. This time, this was a reminder of what no longer needs to sustain them, a memorial, a marker. We stared at the steep hill, whose depth had somehow grown more shallow and full of despair in appearance than the year prior and the sobering reminder of the injustice we fight rose in all of us as a flame. This well had been drilled just one month prior – almost exactly one year from our previous visit. The stark contrast of this grave water source in comparison to the newfound hope of their clean water pump was too great for most of us, and tears flowed. As we stared in stunned silence again, the community chose one small girl from the onlooking crowd to stand for us in front of this hole which was once their only source of water so we could take her picture. She lifted her hands to her chin and smiled with a meek honesty, dressed in vibrant red, innocent and full of life, a deep shadowy hole of dirty water looming just over her shoulder. We recognized this image held the very essence of the conflict we feel and the fight we must continue to raise for the sake of every individual life, especially children as the most vulnerable to water-related disease. As she stood before us, she represented so many lives and so much of our heart. This is what led us to eventually feature this moment as the imagery for our 2018 Water Gala and Year End focus, now that we finally have the chance to tell the whole story. Because we believe rescue has come and hope’s story must be told and fought for, even to the far reaches where it is difficult and, seemingly most unlikely. This village of around 300 people may be surrounded by jungle, may not represent the wealthiest people in the world, may not qualify on the most published ‘top ten’ lists of ways to get noticed – but they were seen and loved by One who came for their rescue. And He never forgot them in their need. As we left, this village walked with us in celebration and joy, sharing gifts and remaining imprinted on our hearts. This is why we must continue, because of this little girl and stories in villages like Gorbendehun. They represent our own stories. We all need hope, we all need rescue. The truth is, there is hope. Rescue has come! We are not forgotten. And the message needs to be told, just as we need to hear it ourselves. People like this sweet girl need clean water, education, and access to medical care today. We grow in joy, peace, and hope as we give and love in community. Together, we can use what we have – do what we can – to change the story and in doing so the world is a better place for all of us. The problem of dirty water and the cycle of poverty is not ok, and a better future is only possible with your help. We hope the story of this village can be a reminder and a beacon of hope for you, as it has been for us. Would you consider giving to our year-end need in order to continue Let Them LOL’s life-saving work? We can’t do this without you.